This bespoke FSC® certified timber Garden Shed was recently designed and built at our Norfolk factory before being delivered and installed for our customers at the stunning Borde Hill Garden. The building measures 2.4 x 1.8m and is a custom-made design built specifically for the centre, with two serving hatches built-in to the gable. This stunning Salthouse Studio was recently installed for a customer based in Haywards Heath, West Sussex. 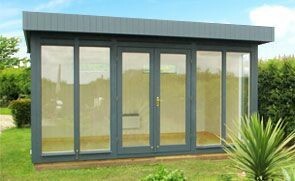 Designed and hand-built at our Norfolk factory, the building is from our range of Garden Studios and makes the ideal work-from-home office. As with all our other FSC® certified timber garden buildings, this studio was both delivered and installed by our in-house installation team. This stunning matching Superior Shed and Greenhouse were recently installed for a customer based in Hassocks, West Sussex. Selected from our range of FSC® certified Scandinavian Redwood timber buildings, the Greenhouse and Shed were both delivered and assembled at the specified address by our in-house installations team. One of our contemporary Salthouse Studios was recently installed for a customer based in Lancing, West Sussex. Selected from our range of stylish FSC® certified timber garden buildings, the studio was designed and built by hand at our Norfolk factory before being both delivered and installed by our expert, in-house fitting team. 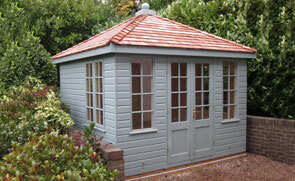 This charming and distinctive Wiveton Summerhouse was recently installed for a customer based in Crawley, West Sussex. Selected from our stunning range of FSC® certified timber buildings, the Summerhouse was both delivered and installed by our expert, in-house fitting team. One of our convenient and attractive Binham Studios was recently delivered for a customer based in Bognor Regis, West Sussex. Designed and built by hand at our Norfolk factory, the building was personalised with a special exterior paint shade requested by our customer and was then both delivered and installed by our expert fitting team. 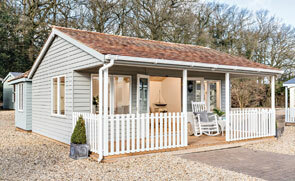 One of our charming Wiveton Summerhouses was recently installed for a customer based in Bognor Regis, West Sussex. Designed and built by hand at our Norfolk factory, the Summerhouse was then delivered and installed at the customer’s address by our expert, in-house fitting team. One of our 3.4 x 3.0m Blakeney Summerhouses was recently customised as a work from home office for a customer based in Shoreham-by-Sea, West Sussex. After working with our experts to get the building looking exactly how they wanted it, it was then designed and hand-built in Norfolk before being both delivered and installed by our expert fitting team. This Delightful Wiveton Summerhouse was recently installed for a customer based in Burgess Hill, West Sussex. As with all of our stunning FSC® certified timber buildings, it was designed and hand-built at our factory in Norfolk before being installed at the customers’ address by our expert fitting team. This charming chalet-style Morston Summerhouse was recently installed for a customer based in East Grinstead, Sussex. Measuring 4.2 x 3.0, the Summerhouse was designed and hand-built in Norfolk before being delivered and installed by our expert team of in-house fitters. One of our quintessentially classic garden sheds was recently installed for a customer based in Littlehampton, Sussex. Measuring a compact size of 1.8 x 2.4m, the shed was hand-crafted at our Norfolk factory before being both delivered and installed by our team of expert, in-house fitters. 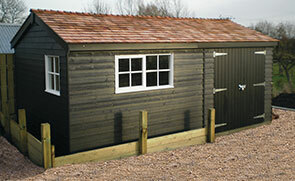 This attractive Classic Shed was recently installed for a customer based in Chichester, West Sussex. Just like all of our FSC® certified timber buildings, the shed was designed and built at our Norfolk factory before being both delivered and installed by our expert in-house fitting team. This attractive Blakeney Summerhouse was recently installed for a customer based in Lancing, Sussex who wanted an outdoor space that could be used all year-round. As with all of our high-quality timber buildings, the summerhouse was both delivered and installed by our expert fitting team. This spacious Garden Room was recently installed for a customer based in Watersfield, West Sussex. Measuring 4.2 x 5.4m, the building was entirely designed and built in our Norfolk factory using only the finest FSC® certified timber and expert craftsmanship amassed over years of working with garden buildings. This stunning greenhouse was recently installed in the quaint village of Fishbourne, West Sussex. It boasts toughened safety glass of 4mm thickness and 2 automatic opening roof vents, to ensure that your prized potting plants are kept comfortable. This National Trust Felbrigg Garden Shed has been installed in Goring-by-Sea in West Sussex for use as a potting shed. Our team delivered and installed it as part of their exemplary customer service.